August 1, 2013 - The Federal Aviation Administration (FAA) has issued its decision to grant ICON Aircraft’s petition for exemption to allow an increased takeoff weight for ICON’s A5 amphibious Light Sport Aircraft (LSA) up to a maximum of 1680 lbs. The exemption would accommodate, among other safety features, a Spin-Resistant Airframe (SRA) which enables the A5 to better avoid loss-of-control scenarios due to stall/spins. The company announced in February of 2012 that the A5 had been successfully tested to and met the full FAA Part 23 standard for spin resistance. The FAA exemption will allow the A5 to become the first conventional production aircraft to meet this rigorous safety standard. 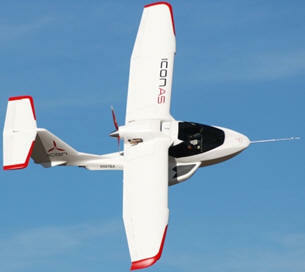 The FAA’s decision enables ICON to continue with A5 manufacturing, currently scheduled for first production aircraft in spring 2014. The FAA’s published guidance allows up to 120 days to issue a decision on any exemption request; however, ICON’s exemption request was not approved until 14 months after it was filed in May of 2012. Faced with the delay, ICON was forced to move forward with an interim design weight that still guaranteed the safety benefits of a Spin-Resistant Airframe. ICON Aircraft is a consumer sport plane manufacturer founded in response to the new sport flying category created by the Federal Aviation Administration (FAA) in 2004. ICON’s first plane is the A5, an amphibious sport aircraft that fuses outstanding aeronautical engineering with world-class product design. It has won some of the world’s most prestigious design awards and has inspired a global following. The company has received more than 940 order deposits and has started manufacturing components of the first production aircraft. ICON Aircraft’s facilities are in Southern California, a hotbed for automotive design and aerospace engineering.